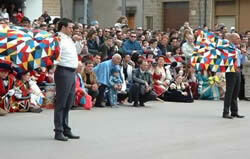 In the town of Carovigno, the unfolding of the ‘Nzegna summons emigrants and tourists alike to an irremissible event each Easter. 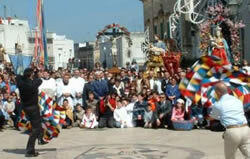 This tradition began around the year 1100 A.D., during Puglia’s Norman period, when Goffredo was the Lord of Brindisi. According to legend, the Virgin of Belvedere appeared to the Count of Conversano (in the province of Bari) and told him to venerate her at Carovigno so that he would be healed of his paralysis. He departed, along with his servants, for Carovigno, but no one knew about the Virgin – just about a place called Belvedere. After arriving in the area, they wandered around all day in the underbrush that covered it. They were about to turn back when, a short distance away, they heard a cry for help. They saw a cow and some herders trapped in a pit among the brambles. While cutting away the brush, they saw the entrance to a cave; the servants, carrying torches, entered and saw an image of the Madonna. The count lowered himself into the cave, and on the wall he saw the image of the Madonna who had appeared to him in his dream. He was immediately healed and let his crutches fall to the ground. The count then bought the cow so that he could give it to the peasants of the town. 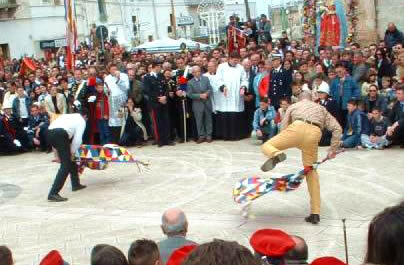 Returning to town, one of the herders attached a many-coloured cloth to a stick and waved it to catch the attention of the townspeople. 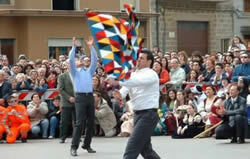 This cloth became the traditional flag of the ‘Nzegna, which is still raised and waved, accompanied by traditional herder music; and the little cow always follows the Easter procession. 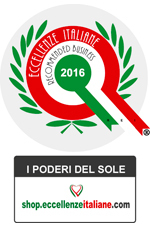 It’s to this ancient tradition that the groups of flag-throwers who today proudly represent Carovigno in all of Europe trace their roots.